You can post a payment from a patient to that patient's ledger. On a patient's Ledger page, click (or tap) Payment. The Enter Payment dialog box appears. Leave the current date entered in the Date box, or click (or tap) in the box to select a different date. However, you cannot backdate a transaction to a date that would cause it to become locked based on your organization's transaction lock setting. Select the Type of payment received from the patient: check, cash, or credit card. Enter the payment details, such as the check number and amount. Apply to charges for - The payment goes towards charges for the patient whose record you are viewing or another member of his or her household. If you select [Guarantor], you can apply the payment to charges for any household members. Paid at patient visit - The payment was made at the office when services were rendered. Statistics regarding payments collected during visits appear on the Payment Analysis Report. The payment amount is applied automatically to the procedure with the oldest date of service and then to subsequent procedures based on the date until the payment amount is used up. However, you can change the Applied amount for any procedure in the procedure list as needed. The Amount Not Applied is the payment Amount minus the sum of the amounts in the Applied column. This amount will appear as a credit on the account of the patient whose record you are viewing, another household member, or the guarantor, according to the selection that you made from the Apply to charges for list. The Amount Applied is the sum of the amounts in the Applied column. 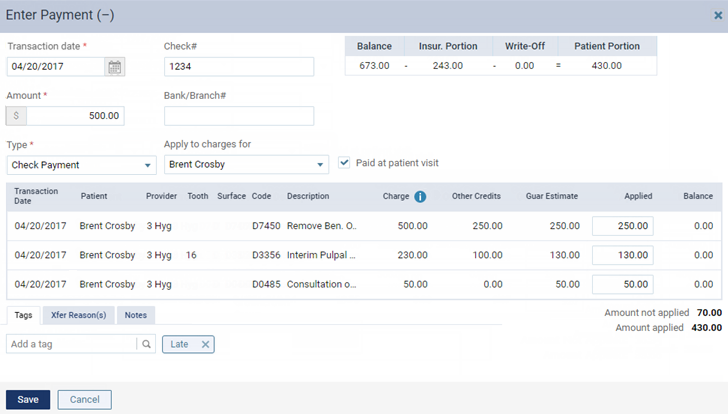 If you are entering a payment for procedures on the same date as the date of service or for procedures prior to the current date that are attached to a claim, Dentrix Ascend automatically calculates the estimated guarantor portion of the charges (if the patient has insurance coverage). However, if you are entering a payment for procedures prior to the current date that are not attached to a claim, Dentrix Ascend automatically calculates the estimated guarantor portion to be 100 percent of the charges. If the patient has insurance coverage, and the estimated insurance portion for a given procedure is 100 percent, that procedure does not appear in the Enter Payment dialog box. Add Tags to the payment as needed. Type any relevant Notes regarding the payment.